In a year in which high-profile productions such as Photograph 51 and Oppenheimer attracted considerable attention for bringing science to the stage, 2015 was also a year in which smaller gems such as Islington Community Theatre’s Brainstorm shone. It was arguably the star appeal of Nicole Kidman rather than the play that drew audiences to the Noel Coward Theatre in September to see Anna Zeigler’s Photograph 51. However, those who saw Kidman’s portrayal of Rosalind Franklin (for which she received an Evening Standard Theatre Award for Best Actress) in Michael Grandage’s production saw a theatrical depiction of an intriguing period in the history of science. Science Centre Stage spoke to Edward Bennett, who played Nobel prize wining biophysicist Francis Crick in the production, about his approach to playing a real-life character and visiting the archives at Kings College London. Photograph 51 is currently nominated for best new play in the What’s On Stage Awards (despite first being performed in the USA in 2007). 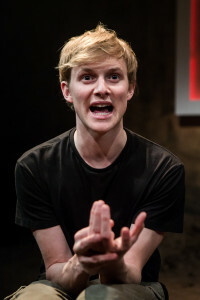 When Tom Morton-Smith’s play Oppenheimer opened at the Royal Shakespeare Company’s Swan Theatre at the beginning of the year, its subsequent success was sufficient to lead to a West End transfer. 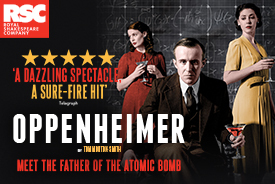 Commuters in London encountered hundreds of posters featuring John Heffernan as J. Robert Oppenheimer promoting the play at the Vaudeville Theatre where it played for two months. The Institute of Physics and Graham Farmelo arranged a panel discussion at the RSC in Stratford-upon-Avon in which the playwright, director Angus Jackson, physicist Prof. Frank Close, science journalist Alok Jha and former Times literary editor Erica Wagner discussed the themes of the play in an event chaired by deputy artistic director of the RSC Erica Whyman. Another panel discussion in May at the Royal Society, also chaired by Erica Whyman, saw Tom Morton-Smith discuss Oppenheimer with Prof. Marcus du Sautoy, Prof. John Barrow and science-theatre scholar Prof. Kirsten Shepherd-Barr (whose new book Theatre and Evolution from Ibsen to Beckett was published by Columbia University Press in 2015). 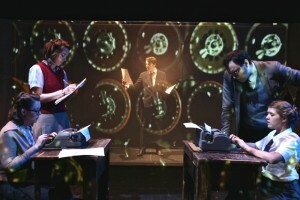 Although Oppenheimer and Photograph 51 offered the highest profile portrayals of scientists in mainstream theatre last year, there were also some very strong smaller scale performances bringing together science and theatre, particularly generated by collaborations between scientists, theatre makers and writers. An undoubted highlight of 2015 was Brainstorm, Islington Community Theatre’s uplifting and energetic piece exploration of the neuroscience of the teenage brain. It was performed by 10 teenagers with support from the Wellcome Trust and was devised by the cast with guidance from UCL neuroscientists Prof. Sarah-Jayne Blakemore and Katie Mills and directed by Ned Glasier. A hugely successful opening run at the small Park Theatre in January led to a well-deserved transfer to the National Theatre’s temporary theatre space in the summer. 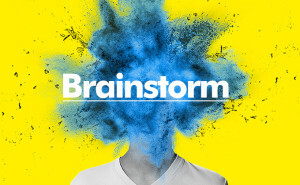 Islington Community Theatre then took part in Battersea Arts Centre’s Live From Television Centre project, resulting in a 30-minute version of Brainstorm becoming available on BBC iPlayer, substantially widening the audience it reached. 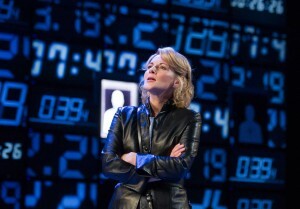 Brainstorm will return to the National Theatre in 2016. Another intriguing production benefiting from Wellcome Trust support in 2015 was Metta Theatres’ Mouthful, in which international playwrights were paired with scientists to produce six short plays about the global food crisis. The result was a thought provoking and engaging production at London’s Trafalgar Studios. Science Centre Stage spoke to Metta Theatre’s artistic director Poppy Burton-Morgan about the development process behind Mouthful and how the scientists and writers worked together to create the plays. Menagerie Theatre also continued their strong programme of pairing academics and writers in their What’s Up Doc? series for the 2015 Hotbed Festival in Cambridge. Pictures of You was writer Craig Baxter’s latest collaboration with Dr. Martina Di Simplicio of the MRC Cognition and Brain Sciences Unit at Cambridge University, in which mental imagery was explored in a short play that was subsequently had a short run at London’s Soho Theatre. There was barely space to swing Alan Turing’s bicycle in the upstairs space at the Arts Theatre (though they tried) as The Hope Theatre’s performed Snoo Wilson’s Lovesong of the Electric Bear in a quirky and offbeat take on the life of Alan Turing directed by Matthew Parker. Meanwhile, Turing also featured in That Is All You Need To Know at the New Diorama Theatre as Idle Motion performed their Bletchley Park inspired piece of remarkable devised physical theatre for the last ever time. At the peripheries of the science-theatre genre lie certain plays presenting dystopic but feasible near-future scenarios. In 2015 the Royal Court Theatre’s production of Jennifer Haley’s The Nether asked pressing questions about the boundaries between the online world and reality during a 12 week run at the Duke of York’s Theatre. 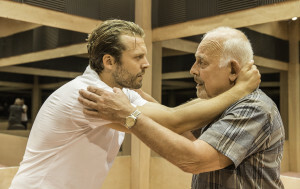 The Young Vic Theatre played host to Southampton Nuffield’s revival of Caryl Churchill’s A Number, exploring the possible consequences of where human cloning could take us. Science Centre Stage spoke to director Michael Longhurst about the background to the play and how he and Tom Scutt worked together on the striking set design. The inestimable Tom Stoppard topped and tailed the year with his new neuroscience-inspired play The Hard Problem opening at the National Theatre in January and a revival of the little-performed Hapgood at Hampstead Theatre in December. Hapgood is a spy-thriller drawing on ideas from quantum physics which apparently baffled many who saw the original production in 1988. However, Stoppard has revised the play several times since, including an updated version for the Hampstead Theatre that runs until 23rd January 2016. The Hard Problem will have its USA premiere from 6th January 2016 at he Wilma Theatre in Philadelphia. Stoppard discussed the play with philosopher David Chalmers, who first coined the term the ‘hard problem’ to address the question of consciousness, on stage recently ahead of the new production. January 2015 saw the death of scientist and playwright Carl Djerassi at the age of 91. Djerassi’s writing about the relationship between science and theatre was extensive and he wrote many plays, including Insufficiency and Oxygen (with Roald Hoffmann) each constructed around some aspect of science. Despite at times being controversial, and with mixed reactions to his plays, his approach was spirited and there is no doubt Djerassi contributed a great deal to the consideration of the place of science on the stage. Jenny Rohn wrote thoughtfully about her own interactions with Djerrassi in a piece for LabLit in March. If 2015 was a strong year for science in theatre then 2016 also has some interesting prospects in store. A new play by Nick Payne for the Donmar Warehouse opens in April. The Royal Shakespeare Company will apply their considerable resources and talents to a new version of Christopher Marlowe’s Doctor Faustus, arguably one of the early depictions of a scientist in theatre. But if Photograph 51, Oppenheimer and The Hard Problem were some of the mainstream successes of 2015, it is the smaller gems that may also be most worth seeking out in 2016.